Denmark, though a small country of less than 5 million inhabitants, has for many years dis­played a marked interest in refugees. In spite of its geographical situation, it has become a country of asylum for thousands of exiles originating from more than 20 countries all over the world. When Denmark learned about the expulsion of the Uganda Asians, the Government on the advice of the Danish Refugee Council, which groups a dozen voluntary agencies, such as the Danish Red Cross, the Danish Interchurch Aid, Caritas Denmark, and Save the Children Fund, immedi­ately decided to receive a number of them. The possibilities for jobs and accommodation being limited, it could only be a small number, but, in return, preference would be given to handicapped individuals or families including a handicapped person. The first sixteen were admitted directly from Kampala, after a selection carried out joint­ly by the Council and the Ministry of Social Affairs, based on dossiers which had been pre­pared by Dr. Cleve Schou, chief medical officer of ICEM. They arrived on November 7, and were put up in a hotel in Copenhagen, where the Refugee Council usually accommodates newly-arrived re­fugees. Later on, more handicapped Asians arrived from the various transit centres in Europe: Malta (five persons), Spain (eight) and Italy (eight). In February, the Danish Government, in addition to its important contribution to UNHCR of US$ 500,000 towards the cost of transport, and care and maintenance of the Asians in these coun­tries, decided to accept another 100 persons; again, handicapped persons will be given preference. "Some of the Asians we have accepted were TB cases, " reports Mr Pief Christensen, the secretary general of the Danish Refugee Council. "After a three months' stay in a sanatorium, we can now consider them as cured. But we also have people with incurable diseases, mental cases who will have to be put into a home." No Asian has yet been offered a job. Several families, however, have already been accommo­dated. Ten days ago, one of them, the Ch. family, was able to move into a flat at Albertslund, some seven miles out of Copenhagen. Mr. Ramzanal Ch. and his wife Gulshan have five children. Two( of them arrived with their parents from Kampala two sons came from England where they were studying and the fifth is on his way. . . Today, how. ever, the family has grown: Mrs. Ch. 's sister, her husband and two children have come from Sweden for a visit; they are at present living at the reception centre at Moheda. A joyful family gathering, to which Mr. Ch. would have liked to add his two brothers, who also landed in Sweden, two others in England, a sister in Switzerland and another in Kenya. "Our family is scattered all over Europe," he says. "Fortunately, the distances are not too great. We shall be able to meet from time to time." Registered as handicapped because of a heart disease, Mr. Ch. says he already feels much better after the treatment he has been receiving since his arrival in Denmark. He is impatiently waiting for the results of the last medical checkup, which should allow him to start looking for a job. In Kampala, Mr. Ch. owned a transport business and would like to be able to use his experience. For the moment, however, he can do no more than study Danish, just like his fellow countrymen. Like them, he receives allowances from the Danish Refugee Council. For the time being, the rent for the four-room flat which the family occupies in a new building, is paid by the Council. Mr. Ch. will start paying for it when his salary and that of his children enable him to do so. The family receives an allowance of 1,330 crowns which is equivalent to what the State pays to pensioners, plus 212 crowns per child. This is enough to live on, considering that, among other things, schooling for the children and medical care are free. Back in Uganda, Mr. Ch. was an active member of the Ismaili community. Today, he is interested in bringing together members of this Moslem sect living in the area. He asked for and obtained permission from the spiritual leader of the community to gather the members at his home for Friday prayers. Later, he hopes to set up a small mosque. Mr. Ch. feels optimistic. He says that he is not afraid of the future. Quite the opposite; he considers himself fortunate to live in Denmark now, and he is full of praise for the kindness and generosity shown to him and his family. On our return to Copenhagen, Mr. Christensen suggests we should visit two other places where we can meet Asians from Uganda. 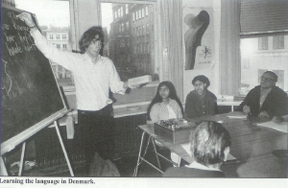 We start with the language school, set up by the Danish Refugee Council. We find the people we are looking for in two classrooms. In one of them, the students are all in booths wearing earphones, while a teacher, who is a real technician, gives them an audio-visual lesson. In another room, the teacher is writing on the blackboard. He asks each pupil the following question: "Taite hun dansk'?" The pupil repeats the sentence, and then has to answer: "Ja, hun talte dansk." Which means (if you haven't guessed): "Did she speak Danish?- Yes, she spoke Danish" The pronunciation is even more difficult than you believe, which is why the young girls prefer to whisper. The teacher, however, is optimistic. "We have only been doing it for 100 hours. With four hours a day five times a week, there should soon be noticeable progress. The main thing is to get rid of shyness." At the Hotel Corona, Danish, of course, is spoken; but to an equal extent Slavonic languages, Spanish and Portuguese, and lately Swahili and Gujerati. Refugees from all over the world, plus the Asians from Uganda, live there. "We would like to meet little Harish," we ask at the reception. He arrives a few minutes later. He is a boy of twelve whom the Danes selected in Malta. He had come there without parents and is probably an Orphan, at least according to what the people say who used to know him in Kampala. He is a lively and mischievous youngster who easily made fiends in Malta; but rebellious, too. We might be able to look for a Danish family to adopt him." He also likes us to take his photograph; on condition, though, that we send it to him. "Of course!" The promise will be kept. Other wishes, other demands, less easy to express, haunt the minds of many a boarder at the corona. Exiles and uprooted people from all over the world, they rub elbows, they talk, they put their heads together, they make plans. What says the oracle? In the nearby harbour, the blast of a hooter. After having met with a squall, a ship is back in quiet waters.